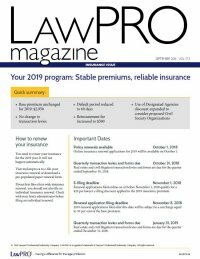 LAWPRO offers a variety of materials for you to choose from relating to TitlePLUS and the Liability Insurance Program. Simply fill in your mailing address below, and select the items you are interested in by filling in a desired quantity. The following materials are available on this website in print-friendly PDF or in HTML format. Click on the title to access the web version of any of the following. Please indicate quantity ordered in the fields below.